Illustrated below are the typical orientation for the U-Connector. No support is required for the 180º return bend for standard loops 2-1/2” diameter and smaller. 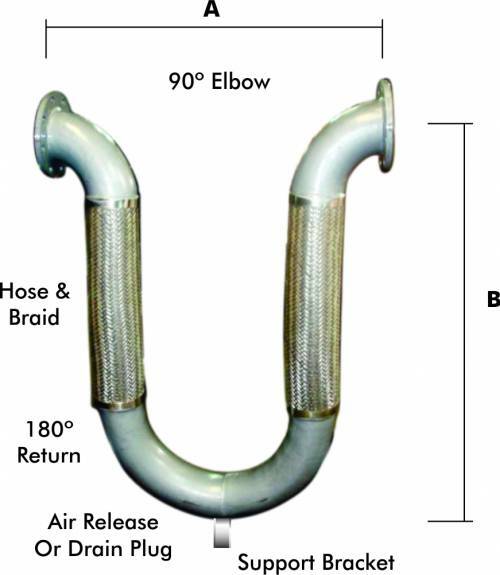 However due to the weight of the return bend and the extreme flexibility fo the loop, larger sizes require support to prevent the 180 from sagging in all orientation except when installed hanging down as shown in illustration #2. Guides are recommended but not always required. 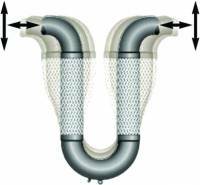 Special Note – For steam service minimize the entrapment of condensate is crucial and loops should be installed as shown in illustration #1. 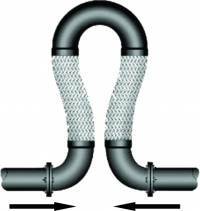 The U-Connector is simply a flexible variation of the tradition hard pipe loop. For any given length of pipe and given temperature change, the amount of movement can be calculated and the appropriate U-Connector can be designed. When installed in a pipe run the U-Connector’s legs simply bend laterally to compensate for pipe’s expansion or contraction. 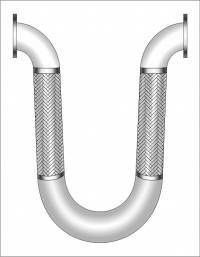 Unique to the loop is the incredibly low amount of force required to bend its legs, minimizing anchor loads, guiding and installation costs. The two flexible legs connected by an unrestrained return bend, will allow a predetermined amount of pipe movement in any direction. (Typical design movement is ±4 inches in any direction, however movement of several feet in any direction is possible). With the loops extreme flexibility and low force to move, the loop absorbs the seismic energy and imposes minimal loads on the adjacent pipe hangers, supports or nozzle loads on major equipment. See page 11 for more details. U-Connector can be connected to adjacent piping with rigid or flexible type couplings. No support is required for the (180°) return bend for U-Connectors 2 inch or smaller. A hanger rod at the 180º that is 12” long or greater, for the +/- 4” of movement U-Connecotrs will allow the loop to swing and no additional steps are necessary. For +/- 8” of movement U-Connectors the hanger rod should be 16” long or greater. If the U-Connector is installed with hanger rods less than distances recommended above, a spring hanger assembly is recommended, to allow the U-Connector to flex during seismic event. U-Connectors are shipped with the shipping bar to insure a neutral face to face during installation. This shipping bar must remain in place during installation, but then must be removed prior to testing. If the U-Connector cannot span the building’s seismic separation, it may be installed with the closest elbow not more than 24 inches from the seismic separation. * When U-Connector is installed in the up (180º bend above pipe run) position consideration should be given to the removal of entrapped air.